#1 Digital learning Platform. From Finland. Combining Finnish educational excellence with gamification and AI. Up to 20% improvement to grades proven by 12 years of university research. AI based learning analytics provide unparalleled visibility to individual learning processes. Automates and adapts to teachers' existing workflows. Easy to customise for any curriculum. Eduten Playground is a digital learning platform with scientifically proven impact on learning results and grades. It also makes teachers' life easier with automated lesson planning and learning analytics. Eduten Playground achieves all this by combining Finnish educational excellence with gamification and AI. Eduten Playground comes with a library of more than 15,000 mathematics exercises for ages 6-15. The exercises have been co-designed with hundreds of Finnish teachers, and they are easy to use with any curriculum. In the core of Eduten Playground's learning impact is a carefully crafted learning environment that motivates students to work more. 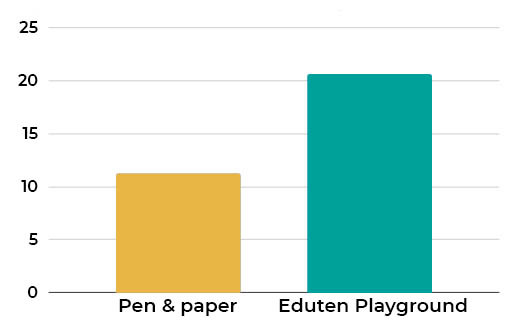 Studies show that with Eduten Playground students solve up to 8 times more tasks compared to pen and paper. Eduten Playground is backed up by more than 12 years of scientific research. These studies show it provides a significant improvement to learning results and grades. For example, one study found that using Eduten Playground for one semester improved grades by more than 14% on average. Mathematics fluency increased as well. Dozens of scientific studies about Eduten Playground can be found here. Eduten Playground also improves 21st century skills, including motivation, self-confidence and resilience to mistakes. Eduten Playground comes with real-time insights for parents, teachers and school management. Teachers can effortlessly follow students’ progress and see students' strong and weak areas. This way teachers can focus their time with the students better, and provide a the right challenge for everyone. Calibrating challenge levels for individual students boosts motivation for everyone. Education management get detailed visibility to teacher or school performance based on student learning results instead of student or teacher activities. These insights enable data driven decision making and reacting to changes faster. Click on images below for a few examples of Eduten Playground’s learning analytics. Starting to use a new tool in a classroom can be a burden for the teacher. Eduten Playground’s features are designed to fit teachers’ existing workflows. Insightful learning analytics, effortless differentiation, effective gamification, lesson planning support and easy curriculum customisation all support teachers in what they do best. Eduten Playground's exercises are automatically assessed. Instead of never ending pop quizzes you can spend more time on providing personal guidance to your students. Eduten Playground's learning analytics provide real-time insights to students’ learning. You can view the progress of individual students or check the performance of the whole group. Eduten Playground's automatic misconception analysis enables you to focus on the students and topics that need your help most. Eduten Playground makes it easy for you to customise the exercises across different ability levels. You can provide a suitable challenge for even the most talented of your students. With Eduten Playground the students are more motivated, want work more and learn faster. Interested to learn more? Together with University of Turku we can arrange a free research pilot in your school.